It is not uncommon for homeowners to go the DIY route for small painting projects. Painting an accent wall or a small room can be done quickly and without causing a lot of disruption in the home. But, as the projects get bigger the skill needed and time required can increase exponentially. 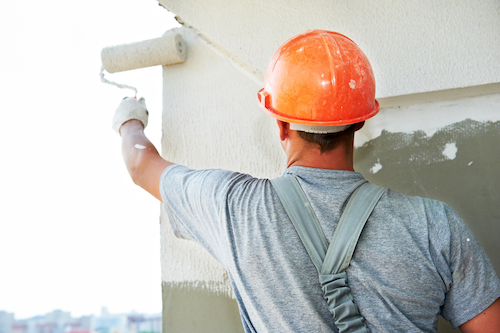 If you own a business, you will find that commercial painting projects are even more complicated. There are a number of reasons for the added complexity. When painting a commercial location you have to work around customers and employees, deal with signage, and abide by regulations that may impact when and what you are allowed to paint. If you have a physical location for your business then that means you have customers and employees that are in and out of the space. This can create a situation where painting the interior or exterior is complicated. If the only option is to have it painted during normal business hours then whoever is painting will have to work around customers and employees. This may lead to the work going slower and areas of your space being unavailable for a period of time. Two other options are to shut down normal operations for a window of time to allow the painters to work unencumbered or ask the painters to work after business hours. On commercial painting projects signage can make the work more complicated. If the signage needs to be removed to complete the job you will have to find someone with the expertise to safely remove and then replace it. Sometimes painting around the signage is an option. This option may be less complicated than removing the signage but can still take quite a while to complete properly. Being sure that you stay within local and industry regulations can get complicated when you are working on a commercial painting project. For example, the town or shopping center you are located in may have rules regarding the way your façade is allowed to look. In addition, if your business is part of a larger entity you may have to follow their guidelines as far as paint colors go. For example, if your business is part of a franchise you will need to use the same colors as other franchises for brand recognition purposes. There are many more elements to consider when you paint a commercial property versus a residential property. The best way to handle a potentially complicated paint job is to hire a painting contractor with a good reputation and proven track record. If you have a commercial painting project in Northern California, D&D Painting can help. We have four decades of experience working with business owners in Northern California and we would love to help your business as well.